Jayme Winell, Julia Read, Maya Lapping Rivera and Robyn Sutton-Fernández . ​ Maya Lapping Rivera and Robyn Sutton-Fernández. 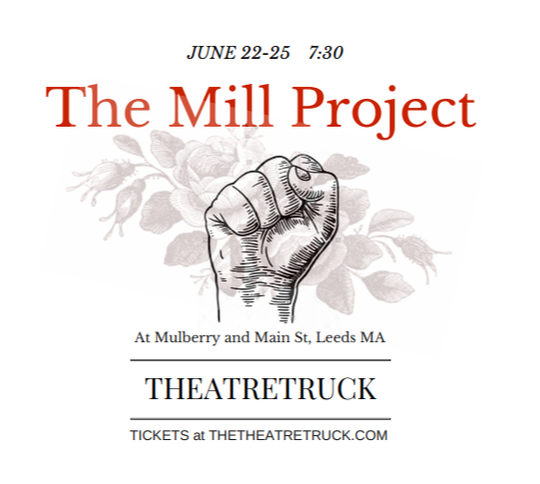 The Mill Project premiered in Leeds MA in June 2017. The creators of The Mill Project entered an intensive developmental process in residency at 12Federal in Greenfield MA, in January 2018, sponsored in part by the Greenfield Local Cultural Council. A public presentation of selected new scenes and music, and a discussion with the artists followed. The history of women’s work in New England mills is rich and full of dramatic potential. While there were many aspects of the lives of female mill workers and nineteenth century women in general that we as theater-makers felt drawn to, we focused on the first generation of workers that came to the mills mostly from New England farms in the 1830s. This was an exciting time, when the rise of factories and manufacturing industry in New England provided new opportunities for Yankee women. As workers in the public, not domestic, sphere, white women’s bodies were put on display in ways that hadn’t been seen in the United States before. It was also a time between wars – a new nation still reeling from a revolution that these women’s direct ancestors participated in, with the threat of division already at their doorstep in the form of the Southern slave economy. The opportunities provided for the white Yankee women in the factories contrasted deeply with the experiences of African American women, both free and enslaved, who at this time faced discrimination and inhuman treatment. Many Yankee women would only stay in the mill for about two years before getting married, and they were replaced by waves of Irish immigrants who toiled for much longer. African-American women could be employed as laundresses or housekeepers, but not in the factory itself, due to discriminatory hiring practices. The factories provided boarding houses where the workers could remain under the paternalistic care of the factory owner. The cost of the workers’ board was taken out of their wages. In larger mill communities like Lowell, there were thousands of workers, but in small towns like Leeds, the owner of the factory would probably have known the couple hundred workers by name. The complicated legacy of the “mill girls” is divided between the rosy picture of the Yankee daughters who finally got to work for “themselves” and the oppressive and dangerous conditions that many workers faced. The working environment of the cotton mill was terribly noisy, the workers left with their clothes covered in dust and lint that they inhaled regularly, causing respiratory problems. The proximity of their working and living conditions, in small boarding houses with no privacy, led directly to collective action and strikes to push for fewer hours and higher wages. Their rhetoric often referenced slavery and wrongfully compared their plight to that of the enslaved. While many mill girls considered themselves supporters of the abolitionist cause, those who worked in cotton mills, using goods imported directly from Southern plantations, contributed directly to the slave economy. In The Mill Project, we have taken the voices of these women, using their own words, to tell a story that highlights the importance of women’s work outside the home, the foundation of a labor movement that still exists today, and the complicated perspectives that emerge when re-presenting history. Christine Stevens has been making theatre in the Valley since 1989. A co-founder of Hampshire Shakespeare Co (1989-2001), and certified teacher of the Alexander Technique, she has taught theatre and the AT - faculty member of the Brown/Trinity MFA Program for Actors and Directors (1999-2014), UMASS, Marlboro College and performed both Shakespeare and improv as well as years of corporate theatre as a founding member of DramaWorks Interactive. Proud member of the Ha-Ha’s and even prouder mother of Olivia and Jane. Jayme Winell is an artist/educator/learner originally from Colorado and California. She has studied dance for over twenty years and encourages her students to tap into their inner choreographer. 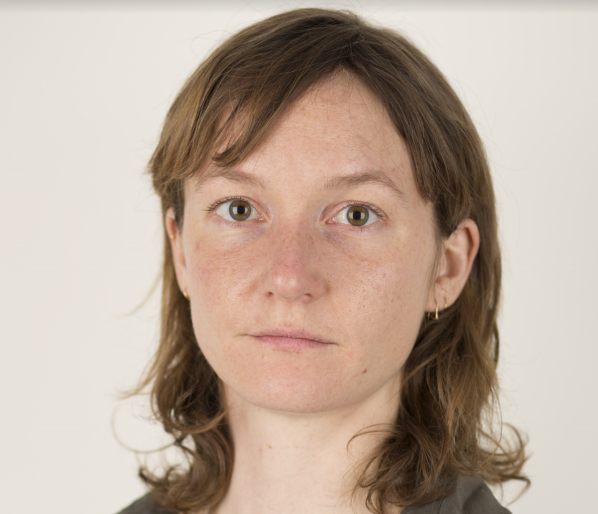 Jayme studied dance at the San Francisco School of the Arts and then at Hampshire College she studied social movement history with a focus on dance and theater for community building. There, she created and performed in THE RED FLAME, an exploration of her mill-working-organizing grandmother told through theater, song and dance. Jayme performed in TheatreTruck's THE WATER PROJECT and is a proud collaborator with the tinydance project and is writing original rabble-rousing songs with the band Flame N' Peach & the Liberated Waffles. Julia Read is a musician, performer and teacher who just moved back to the Pioneer Valley. She has collaborated with dancers, filmmakers and other musicians, most recently starring in Elizabeth Orr's film MT. RUSH, which premiered at Anthology Film Archives in NYC. Julia is a proud and longstanding member of The Royal Frog Ballet here in the Valley. She has released two albums of original music, which can be found here. Learning a bit about some remarkable histories and playing with the wonderful and hard-working members of TheatreTruck has been a delight and an inspiration to her. Maya Rivera recently graduated from Smith College with a degree in Theatre and a Concentration in Acting. In addition to exploring a variety of theatre and acting courses at Smith and the Five Colleges, Maya also studied and trained in classical singing with private voice lessons for four years. Maya fell in love with performing Shakespeare when she studied classical acting at the London Academy of Music and Dramatic Arts in the spring of 2015. Some of Maya's professional acting credits include playing Snail in New Century Theatre Kids' musical production of A YEAR WITH FROG AND TOAD, Snug/Snout/Cobweb in Hampshire Shakespeare Company's A MIDSUMMER NIGHT'S DREAM, Caroline in the Huntington Theatre's THE HAPPY JOURNEY TO TRENTON AND CAMDEN, and Lauren in New Century Theatre's CIRCLE MIRROR TRANSFORMATION. Maya performed in the Live Art Magazine this past fall at the Academy of Music in Northampton, an annual pop-up showcase featuring a variety of acts by local writers, musicians, students, performers, comedians, and more in the Pioneer Valley. Robyn Sutton-Fernández has truly embraced her love for the theatre after returning to school following a twenty year absence. Robyn has had the honor of portraying Fannie Lou Hamer in Ping Chong and Talvin Wilks’ devised production of COLLIDESCOPE 2.0 at UMASS Amherst in April 2016. She also took on the lead role of Esther in Lynn Nottage’s play INTIMATE APPAREL at Mount Holyoke College. Robyn recently graduated from Mount Holyoke College as a Frances Perkins Scholar and received her bachelor’s degree in Theatre Arts where she focused on acting, directing, and playwriting. Robyn feels privileged to be a part of THE MILL PROJECT and relishes the opportunity to bring to the stage the visibility and voice of these pioneer women.